The David Elsworth-trained Sir Dancealot, the 5/1 joint-favourite, got up in the shadows of the post to land the G2 Qatar Lennox Stakes. The four-year-old son of Sir Prancealot endured a troubled passage throughout the home straight in the seven-furlong contest under Gerald Mosse, but once finding room a furlong from home, the bay gelding showed a tremendous turn of foot to score by a short-head from David O'Meara's Suedois in second. The David Simcock-trained Breton Rock, the 2017 winner, was head behind in third. Newmarket trainer Elsworth said: "He got into more trouble than I get into down the pub on a Saturday night after I have had a few. Sir Dancealot would have been a very unlucky loser. "I describe Sir Dancealot to the owners as like a tennis ball. He is bouncing up, going up, and I just wondered if he had reached the point of equilibrium - whether he had stopped or was even coming down. His level of form has been very good, which gave him a very good chance today. "Four was a difficult draw for a horse who needs to be taken back a little bit and relaxed - he wants to do his running in the second half of the race. Gerald had a problem getting organised and everyone is trying to win. Whether the gaps materialise - a lot of good luck and good fortune is involved. "We got lucky in the end but I feel he would have been an unlucky loser. We better be gracious in victory and say that it was a scramble. "We had a crack at a G1 with him the other day and there are lots of races open to him. I put him in the Hungerford Stakes today. "He is gelded now - he seemed to hang a little under pressure last year and, whether the gelding has helped because his undescended testicle seemed to cause him some discomfort. He is going very straight this year and I am sure it has helped him enormously. "Winners gave every trainer satisfaction and it's nice to be associated with good horses." 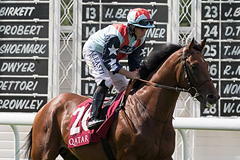 David O'Meara, trainer of the second home Suedois, said: "He has run a blinder - there isn't really much more to add." Danny Tudhope, rider of the seven-year-old, added: "That was another good run. He has taken a step forward - he always takes a step forward at this time off year." David Simcock, trainer of the third Breton Rock, commented: "I'm delighted with the way he ran. For an old boy, he's run his heart out. He doesn't let us down very often and for a moment we thought he might win but we're very pleased with third place." Martin Harley, the third's jockey, added: "I'm very pleased with the way he ran - he ran a good race. He obviously likes it here at Goodwood. I would have preferred to follow someone for a little bit longer, I tried to sit on him for as long as I could because I didn't want to get their too soon, but he deserves a lot of credit. He's not getting any younger, but he's still got it."